Are you getting the leads and sales your business deserves? Perhaps you’ve invested in a new website, posted tons of content on your blog and promoted your business with endless social media updates. But it isn't yielding the rewards you'd hoped for. We get it. We’ve seen it before, and we’ve got the knowledge to solve your biggest marketing challenges. We use the latest digital marketing techniques to create inbound marketing plans tailored to your business needs. We'll help you fulfil your website’s potential, generate leads and sales from your blog, and shout to the rooftops on social media! If you want answers to your marketing problems, read on! This is a 15-point help-sheet showing you how we get your marketing campaigns to perform. It deals with your most common digital marketing challenges one-by-one and offers effective, evidence-based solutions. If you want to achieve any of the following goals, you'll benefit from working with us. Red-Fern Media understand the challenges of creating a knockout digital marketing strategy. You need your marketing campaign to achieve whatever goals you've set. But do you know if the money you’re spending is having a positive effect? Without the right support, it's hard to know if your marketing strategy is getting the results you want. At Red-Fern we can help you link your marketing goals to your company’s bigger goals. We’ll ensure that every marketing campaign helps you get closer to achieving your goals and delivers a great ROI. We conduct a full-scale analysis of your website, there's no guesswork involved. Our precise, evidence-driven approach puts you in control. The inbound marketing approach puts the customer at the heart of everything. But what if you’re not sure who your customers are or what value proposition you can offer them? At Red-Fern we use the latest market research to help you identify your ideal customers. This research gives you the basic knowledge you need to create buyer personas, fictional representations of your customer that we'll base your marketing strategy around. Using the latest research, we put together a detailed personal profile for each persona. This gives you clear insights that you can use to reach these personas with your marketing campaigns. As you can see below, streamlining our customer profiling more than doubled our lead generation results in four months. Once you’ve put a ‘face’ to your ideal customers it’s much easier to reach them with your marketing. But have you thought about how visitors become loyal customers? Red-Fern provides you with the tools to understand their journey. We’ll help you to identify where your web traffic comes from, and which traffic sources are most likely to convert to leads and sales. If most of your customers come from desktop, you should ensure your website is optimised for desktop. Don't ignore other platforms though! We’ll also look at your website's design to make sure it takes the prospect on a logical journey from pain to solution. When you understand your customer’s journey, you have the power to solve your marketing challenges and transform your business. Search engines like Google help people find the products and services they need. To be successful, your website needs to appear on the first page of results for the most commonly used keywords and phrases. Red-Fern can help you identify the most popular keywords used by your prospects. We'll devise a keyword strategy and blog calendar to drive more traffic to your website. We’ll also help you develop premium content that aligns with your strategy goals. This will engage your customers, boosting your Google ranking and increasing web traffic. Need proof? FastPay are one of our inbound clients. With our inbound strategy and keyword research they've seen a steady increase in first page search results in the past month. Without tracking software and data analysis it can be hard to know how your website visitors move through the sales funnel. We'll show you how your customers navigate your website, and where you can improve performance to deliver better results. Understand how targeted content can help you identify what type of content to push to your customers at different stages of the buyer's journey. Whether they're interested visitors, qualified leads, or happy customers and brand advocates. Google Analytics can give you tons of information about your customer journeys. For example, you always want browsers to keep coming back to your site and attract new visitors. This gives an indication of customer loyalty and growth. If you’re not sure how your website is performing, it’s difficult to know how to improve. At Red-Fern we start by analysing your website’s current performance, showing you how well you’re doing in various areas. From functional aspects like like website speed to design elements like banner positioning. After collecting this information, we can help you develop a marketing strategy that will enhance your existing strengths and improve on your weaknesses. Our in-depth data analysis takes away the guesswork, so you can make necessary improvements based on hard evidence. As you can see, our digital team have been working hard! The sharp increase in traffic is largely down to their work in the past 6 months. Marketing works best when you plan ahead, but it can be hard to get organised. We provide tailored marketing plans. To solve your digital marketing challenges you need to think strategically about how your inbound campaigns align with your overall company goals. With on-going analysis of each campaign, we can help you identify your most successful content and sources of traffic. As well as helping you create and target your premium content to generate more leads. Once you know what works, you can build on your success. Every step takes you closer to achieving your company goals. The graphic shows our most popular pages, once we know what's performing and what isn't, it's easier to edit and improve your content. If you struggle to put your plans into practice, Red-Fern’s marketing team will make your dreams a reality by providing you with all the details you need to make your marketing campaign a success. Whether it’s varying the type of content you provide, targeting different customer personas, or coordinating your campaigns on social media, our executives makes things a lot easier to manage. We base our knowledge on solid evidence-based research, so you can be sure you’ll see results. When you mix all these project elements together, you get customers! See how FastPay increased customers by 400% in four months! Sometimes it’s hard to come up with original ideas for blogs and you find yourself repeating your content ideas. We can help, by giving you SEO-focused blog post outlines as part of our inbound marketing plan. Our tailored outlines ensure your blogs contain the keywords that will drive visitors to your website. You’ll receive numerous content ideas that will keep your visitors engaged. With content targeted at your ideal customers, you’ll soon see a boost in your visitor numbers, leads and sales. If you're struggling for ideas, try this blog topic generator. If anything, it creates a few laughs in the office! If you’re not a content writing specialist it's difficult to produce the premium content that will generate leads for your business. Contrastingly, others think that writing is easy (it's something we do everyday after all!) and either take on the job themselves, or hire cheap writers. This can often dent the quality of the work and hinder your chance of success. Saving a few pennies might sound better short-term, but it'll cost you in the end. We're always happy to work with any in-house writers or marketing professionals you have at your firm. We do the job to build relationships and learn from people, and that's the best way to achieve those goals! We started blogging in July 2017 and quickly started to see results. In January we really started to reap the rewards with a sharp increase in organic keywords. We have included a FREE guide at the bottom of the page. We show you the dos and don’ts of writing for your website, making it easier to generate leads and convert them to sales. Brand profiling is a fantastic starting point when solving your marketing problems. Your brand shows who you are in its purest form, it's the image people conjure up when they think of you. You should use your brand to create awareness. Awareness campaigns can be a very effective way to put yourself on the map and raise your brand’s profile, but they work best when the content on offer is a valuable resource for your customers. Whether it’s an e-book, case study, or white paper, premium content offers can take time and to get right. Awareness campaigns are great for putting your brand on the map, but it's important to get tangible results. Having 3,000 more Facebook likes but little sales doesn't really do much for your business, so awareness must lead to your customers considering and buying your product. Red-Fern have years of experience generating premium content that cements your brand’s authority. Our awareness campaign helps you reach your ideal customers with high-quality content that will build brand recognition and authority. Automated emails are a great way build awareness and nurture your leads, but if they’re not thought through they can be perceived as annoying and low value. How often have you received an email that holds no relevance to anything you desire? We've been working hard to ensure we send out the right emails at the right time, to keep our leads and customers interested. Red-Fern offer you email automation options that engage your customers and help you plan for email success. If you’re unsure how to coordinate your content on social media, our social media plan will help you identify the networks where your customers can be found. It’ll also help you schedule posts at the right frequency and time, boosting your engagement and followers, and driving traffic to your website. When you plan your social media content in advance, it’s easier to respond to events as they happen, making your brand responsive to your customers’ needs. The social media landscape is huge, so it's important to know what services marketing agencies offer and what platforms and software they work with. We've been working with Executive Headhunters since January and their social media engagement continues to rise month-by-month. Most online businesses know that a good user experience (UX) is key to a website’s success, but many don’t have the staff to track and analyse their users’ behaviour. This causes marketing challenges, as you don't know why users are leaving your site. At Red-Fern, we can produce and analyse heat-maps and site recordings. This valuable insight shows how your customers navigate between pages will identify any problem areas where users bounce. These insights will help you improve your website’s responsiveness and make your UX as seamless and intuitive as possible. When it’s easy for your customers to find what they’re looking for they’ll keep coming back. See how our knowledge of marketing and web design keeps your bounce rate low, as we did for Junction 4 Skatepark. With a whole host of marketing software available, it can be very hard to know which program is right to support your inbound marketing campaigns. Red-Fern has the expertise to help you decide which software will help your business achieve its goals. 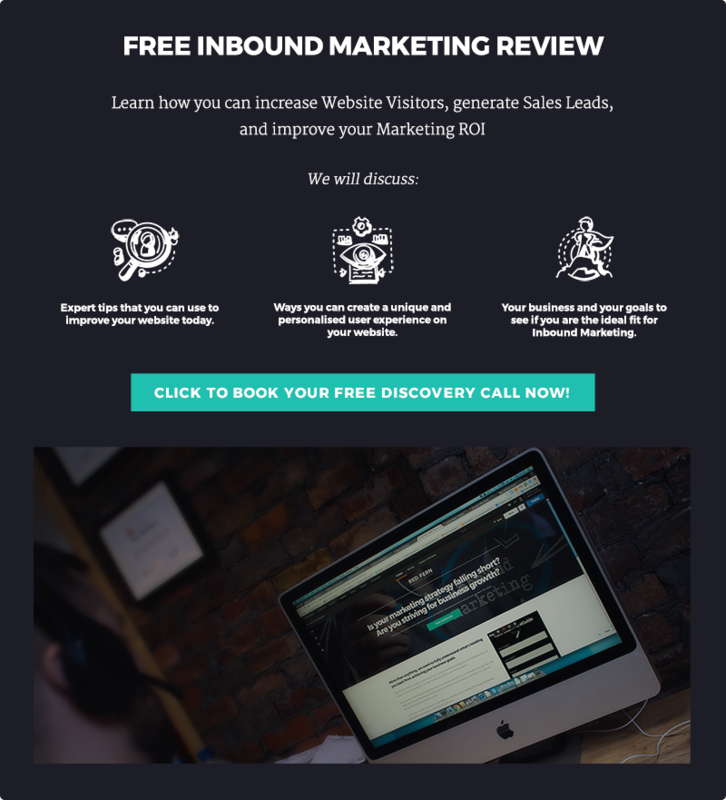 We use HubSpot, we're a partner agency and follow the inbound marketing philosophy. It's helped us scale our growth and control the annoying, repetitive tasks that take up time we could be spending with clients. Remember, there are numerous benefits to each point not just the ones we've listed. If you want to achieve any of these goals, get your FREE inbound marketing review, and we'll solve your marketing problems!